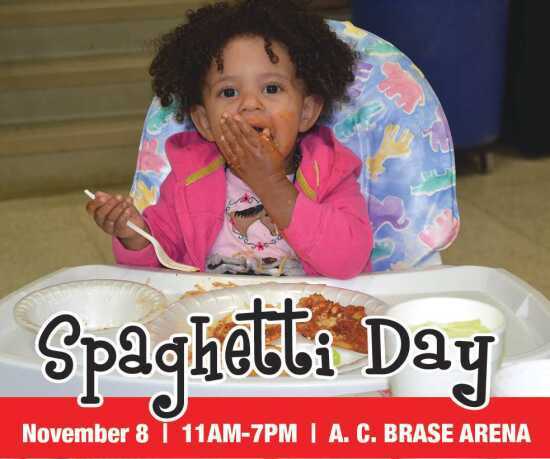 Join us for eat in, take out or delivery at the Cape Girardeau Parks & Recreation Foundation's annual Spaghetti Day on Thursday, November 8! Lunch and dinner will be served between 11 a.m. - 7 p.m. at the A. C. Brase Arena. Cost is $8 for adults (13+), $5 for children (ages 5-12), and free for ages four and under. The meal includes spaghetti, mostaccoli, garlic bread, salad, drink and dessert. Dinner entertainment will be by The Jerry Ford Orchestra, and Hunter Valley Winery will have wine available to taste and purchase during the evening hours. Proceeds benefit the Cape Girardeau Parks & Recreation Foundation for various improvements to the Parks & Recreation Department facilities and programs.